Ever wonder what a French Horn looks like before it gets completely twisted? Or a soda can before it gets a top and a tab? In the Making, an upcoming exhibition at London's Design Museum curated by British design golden boys Edward Barber and Jay Osgerby, will present a range of familiar products in various states of not-quite-finished-yet to give a glimpse at the industrial goings-ons before an item hits the shelf. The show fits in nicely with the rising tide of consumer interest in responsible manufacturing; from Foxconn and Apple to garment factory collapses in Bangladesh, people are becoming more aware that there's a huge human and technological backstory to what they buy. While it looks like this show will focus more on the physical transformations our things undergo, as opposed to the financial and political logistics of how that sausage gets made, a continued emphasis on the fact that goods don't just appear on Amazon fully-formed is great to keep the conversation going. Plus, from the looks of these initial pics, it's absolutely fascinating to see this normal stuff stripped down and altogether unfinished, with otherwise easily recognizable objects photographed and presented in all their incomplete glory. Catch In the Making in the flesh at the Design Museum from January 22nd to May 14th. 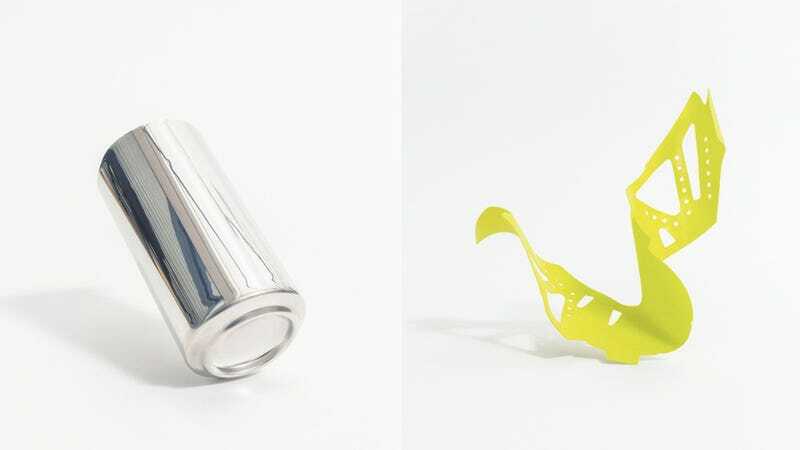 Lead image: Soda can, and—believe it or not—a football (aka soccer) shoe.